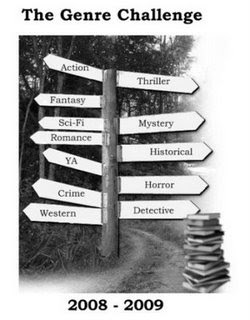 The goal: To read one book in the following genres: crime fiction, detective fiction, mystery fiction, horror fiction, thriller fiction, romance fiction, science fiction, action/adventure fiction, fantasy fiction, realistic fiction, historical fiction, and western fiction. Specific definitions of these genres can be found in this post. 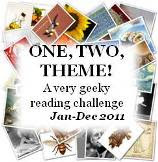 There are several options (visit the challenge post to see what they are), but I'm choosing to read all 12 genres. This Challenge looks really interesting, but I'm holding out for a few others that I think are coming around the bend. I can't wait to see what you choose though! Definitely a good challenge to get you to read genres you might not usually reach for. Regarding crime fiction ... I'm not sure how you feel about Australia authors, but I can recommend Peter Temple as a great crime writer. Bad Debts is one of his earlier and best works. I'm not a huge crime fan, but I love his stuff, which is very character driven. Otherwise, if you're looking for something more popular, you can always try Patricia Cornwell's very early Scarpetta novels (if you haven't already). paula - thanks for the recommendations, I'll look into them. I just have trouble identifying crime fiction, as opposed to some of the other genres, I think. Peter Temple sounds interesting!